Distributor: Upcoming DVD release in North America by Buena Vista Entertainment. Notes: Loosely based on the Earthsea books by Ursula K. Le Guin. After murdering his father and taking his sword, Prince Arren flees to the outside world. There, he meets the wizard Sparrowhawk, and joins with him in an attempt to find out what fear drove him to abandon his life and his humanity and do what he did. The first thing I'd have to admit before starting on the review full is to say that, no, I haven't read the Earthsea books, nor am I particularly familiar with the material within. (As opposed to... say, the Lord of the Rings movies vs. the books I also haven't read.) Given what the author of the Earthsea books thinks of said movie, this probably doesn't mean a whole lot, though. But I feel it needs to be said all the same, simply because of whatever disappointments I have with this movie, they do not extend to factors like what I feel is missing from the books or what I would have felt the movie did wrong. Even so, the start of the movie made me feel like I should have read them to better understand what's going on. Instead, after a short montage taking place over the sea, we are thrown straight into the king's murder without as much as a moment spared for setting things up. And once that's happened, the rest of the movie are mostly centered around a handful of people. No world-building, no history lessons and no explanations beyond a few lines about dragons and human beings and how they once used to be the same race. I have to admit I found the assassination a bit intriguing, though, especially given who did it. Arren seems to be playing the part of the tortured, young lad who occasionally abandons his sullen disposition for a recklessly agitated one. And it's during one of these fits that he meets up with Therru, a young girl about to be taken by slave traders. A large part of the left half of Therru's face have been burned due to abuse by her former charges, which plays a large part of why she doesn't easily open up to people, but Arren further alienates himself from her by his reckless abandon of his own life, which angers her greatly. Rounding off the main cast is Sparrowhawk and Tenar. Sparrowhawk is travelling around looking for the cause of the world's balance being thrown off. He's more than happy to help Arren find the cause of his problems, though he's also smart enough to realize that it might have some ties with what's going on in the world. He's also an old friend of Tenar, a middle-age woman living out on a farm in the countryside, who's also Therru's adoptive charge. While Therru minds the animals on their little countryside farm, Tenar spends her time tending her herbal garden, creating medicines which she (presumably) sells to anyone who wants them, even if they're sneering, back-talking old hags like the character types found in this movie. She also helps Sparrowhawk help Arren to come out of his shell, so to speak. The movie is mostly up to scratch when it comes to art and animation, at least if you're thinking general quality. The action sequence at the beginning is both fast and fluid, giving the movie a grand sense of epic adventure, but it never really follows up on this. And that's the damnedest thing; the whole movie feels kind of slow, like there's something missing. Given that it's based on the first, third AND fourth book, that might not be far from the truth. There is an abridged feeling to it that makes the ending rather unsatisfactory, even if you were to compare it to the ending of Whisper of the Heart. And therein lies the problem, because while this is not a bad movie, its pedigree is doing it no favors. (Nor its origin, most likely.) Now, there are some pretty great moments in this movie, the one that sticks most to mind actually being Therru's song in the middle. No accompanying orcestra. No choirs. Hell, her voice actor isn't even a great singer. Just a simple song about a girl who just wants to find somewhere to call home. And for some absurd reason, that made the whole moment feel far more earnest in its simplicity. Fellow reviewer and friend, Jason Huff, once said in his review of this movie that noone should have to live up to their father's reputation. I'm not about to start a debate on whether he wants to or whether he should, nor do I particularly want to give Hayao Miyazaki's son a hard time about this movie. However, if this is what he desires most of all, I honestly would like for him to continue his father's work and keep the Miyazaki name held in high regard. Sadly, this movie isn't going to do that. Recommended Audience: This movie isn't particularly violent, but there are a few scenes that shouldn't be watched by younger viewers, particularly at the beginning and end. Aside from the (relatively mild) violence, the movie also takes up topics like child abuse, drug abuse and the effects of long-term addiction, and also slave trading. Version(s) Viewed: European R2 DVD release, bilingual. 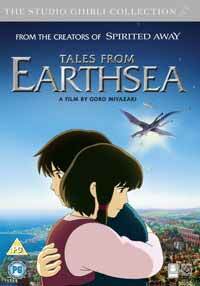 Tales from Earthsea © 2006 Studio Ghibli, Buena Vista Home Entertainment.